D.J. 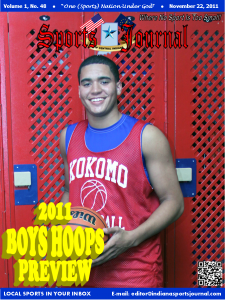 Balentine is Kokomo's Indiana All-Star candidate and looks to return the Kats to Conseco Fieldhouse next March. Anyone who watched the Kokomo boys basketball team lose to Bloomington South in the IHSAA Class 4A state championship game last March knows the 2011-2012 Kat team has one goal this year – WIN! With Indiana All-Star candidate and Evansville signee D.J. Balentine leading the way, the Kats want to hoist a blue state championship banner next to the red runners-up banner that recently found a place in the Memorial Gym rafters and erase the memory of a poor shooting performance in the finals. But McCauley cautioned that while having big aspirations are good, this team will need to work hard to get back to Conseco Fieldhouse. The team will have a big red target on its back this year. Joining Balentine on the floor will be three players who contributed heavily to the Kats title run: senior Armon Bridgeforth, junior LaBradford Sebree and sophomore Taylor Persons. Senior Jalen Tinder saw time off the bench last year and should contribute this year. McCauley said he will rely on a strong senior class this year. And now, let the Kat march to Conseco begin. A new face will be roaming the Eastern Comets varsity bench this season, but it isn’t necessarily a new face to the Eastern Comets. 2001 Eastern graduate Kyle Bedwell moves up from the junior varsity team to take over for retired coach Duane Keisling – and he takes over a team with two strong performers but otherwise not much experience returning to the floor. Leading the Comets will be 6-foot-5 three-sport standout Josiah Price, a Michigan state football recruit. Last year, Price averaged nearly 19 points per game and nine rebounds in an all-conference season. He will be joined by returning point guard K.J. Myers (3.6 ppg and 1.7 assists per game), a junior who brought the ball up the court for a majority of his sophomore season. “We lost five seniors last year, and that will be hard to replace,” said Bedwell. “Josiah Price will be a strength for us. Unfortunately every team knows that and they will try and take our strength away. Hopefully Michael Haynes, another senior, will reap some of the benefits of that – as will Josiah Marx (2.4 ppg). The first-year coach said a lack of varsity experience will be a major hurdle to overcome this year, but he has a solid core of players ready to fill those roles. Sophomore Braden Gibson should see time in the backcourt with Myers, while senior Trae Herglund, juniors Grant Cole and Josh Keith, and sophomore Will Porter are prepared to take other roles with the Comets. Senior Micah Marx and junior Hayden Vint should also see varsity time. Most coaches would love to have senior experience return to a team which saw progress a year ago. For Northwestern coach Jim Gish, that is exactly what he will get as nine seniors return for the Purple Tigers. Leading the senior-laden Tiger squad is 5-10 all-area point guard Kylan Dubbels, who tallied nearly 16 points per game, four assists and four rebounds per game a year ago. Gish said three other seniors saw significant playing time last year, including another 5-10 guard in Tanner Thomas (10.7 ppg). Joining that Tiger four-some are fellow seniors David Alexander, Jordan Carpenter, Zack Gabriel, Cody Yeakel, and Dakota Eller. Rounding out the squad is 6-3 junior forward Trenton Brazel (4.4 ppg) and 6-7 junior Chase Johnson. With nine seniors and a solid junior class, this will be an exciting year for the Purple Pride. The Taylor sidelines will look vastly different this year. For the first time in 20 seasons, Jeff Fisher is not the head coach of the Titans after retiring in March. The void of filling the shoes of a coach with 186 career wins and the 2000 regional title will fall to rookie head coach Andy Lewman. Lewman has been a teacher at Taylor Middle School while serving as assistant coach at his alma mater Delta High School. He also coached for one season at Anderson High School with recently retired head coach Ron Hecklinski. “I was fortunate to work with Paul Keller for several years, and last year with Stan Daughterty,” said Lewman. “So, I have some experience on the bench and now look forward to getting my own program established. Lewman inherited a Titan squad that lost a senior class that included all-area center Tyler Simmons and scorer Matt Brankle. Seniors Dale Ray Washington, Cameron Clark and Justin Wheeler will need to fill those holes and lead Taylor to success. Lewman said he takes each team and determines what style he will coach – this year will focus on quickness. Lewman said he has made the right choice in leaving the Delta program and taking over the Titans – and he appreciates the legacy left by Fisher. With the departure of Jeff Fisher at Taylor, Western’s Andy Weaver is the new dean of boys basketball coaches in Howard County. And with five contributing players returning from last year’s Mid-Indiana Conference and Class 3A Frankfort Sectional champion team, he is ready to get back on the floor for another run. He said he had an eight-man rotation last year, so with the loss of three seniors, he has five solid players returning from last year’s Elite Eight squad. He points to a pair of returning guards as a solid starting point for the Panthers. Sophomore guard Evan Warden (5.5 ppg) caught a lot of opponents by surprise last year. This year, he is an integral part of the Panther rotation. Joining Fields and Warden will be 6-4 senior forward John Capps (7.3 ppg), 6-4 senior forward Matt Orr (4.8 ppg), and 6-6 senior forward (4.2 ppg). Coming off the bench is 6-7 junior Ronnie Smith. The veteran coach does not want to look into a crystal ball and make any predictions, but he says hard work pays off in the end – and that is something this team will need to pay attention to. This entry was posted in Balentine, Basketball, Eastern, High School, Kokomo, North Central Conference, Northwestern, Taylor, Western, Wildkats. Bookmark the permalink.